The only downside: Great Escape is only available for a two-week window and requires advance booking. I settled on my chosen date of 11th February some time ago, without consulting any long-range weather forecasts, and I was stuck with it even after the barometer started to drop. As it turned out, I didn’t have too much to be concerned about. Yes, it was cold, but it was dry. Wrapped up warmly with gloves and a fetching scarf, I was quite comfortable, even on my train from Liverpool South Parkway to Stafford, which appeared to have no working heating. Also, I wasn’t alone. Joining me for a second jaunt (following our Watford excursion back in September), were Mersey Tart Scott Willison and Mr Metro-Land himself, Ian Jones. I was glad of the company, for this trip would be slightly more complicated than most. 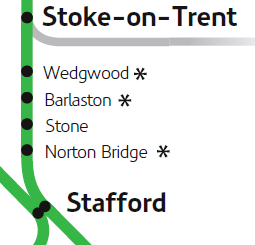 My target was the notorious Staffordshire “ghost” stations – three stations, on the line between Stafford and Stoke-on-Trent, which are technically still open, but haven’t seen a train since 2003. 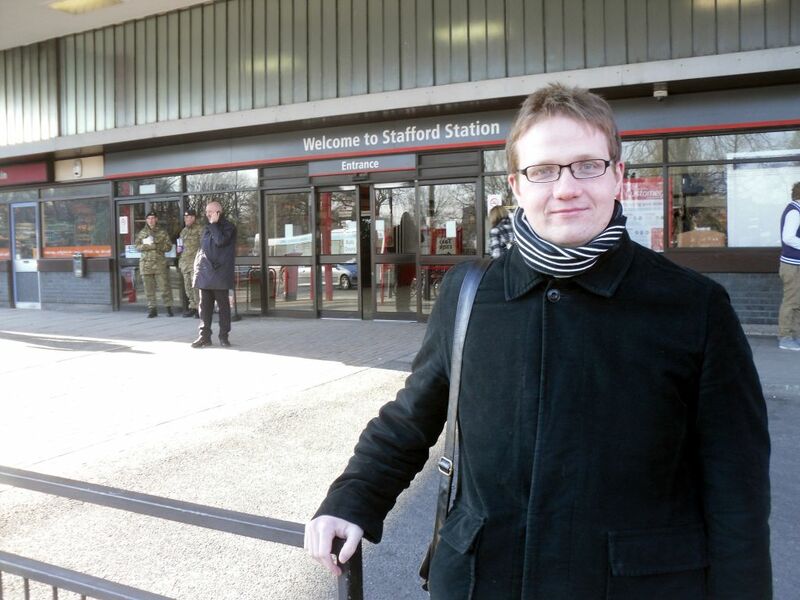 Scott and I arrived at Stafford station just after ten, where Ian was already waiting for us. Poor chap – as a condition of the Great Escape ticket, he had been confined to London Midland’s slower trains, meaning a 7am start from London. He had also suffered the indignity of a London Underground rail replacement bus. We paused for a moment to “appreciate” Stafford’s station building. It’s a relic of the 60s, having been built during the West Coast Main Line electrification project. It’s a functional concrete building which is never going to win any architecture awards, but we still got some photos for completeness. 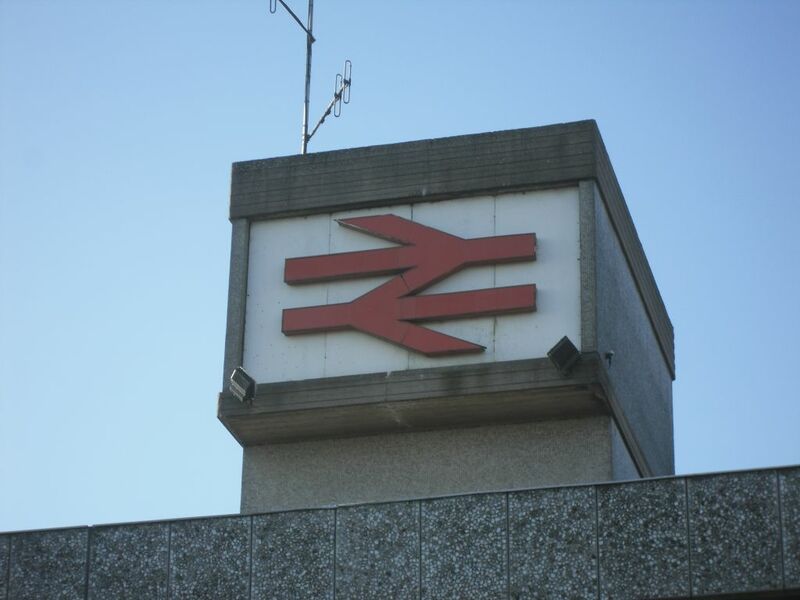 It does have a nice big BR double-arrow prominently displayed on the highest part of the station building. It looked like it had last been cleaned in about 1986, but still pleased me. Having done that, we headed for the bus stop on the station forecourt. Paradoxically, this particular railway adventure was going to involve a lot of buses. 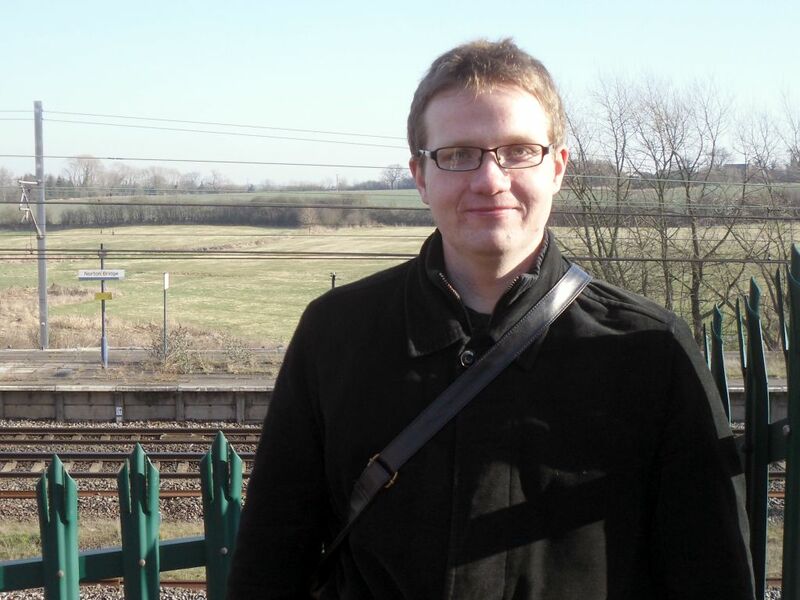 Our first station, Norton Bridge, is just a few miles north of Stafford, but is inaccessible by train – and, in fact, inaccessible by any means at all, as we soon discovered. My own self-imposed rules for this blog are that for a visit to “count”, I have to arrive and/or depart by train. 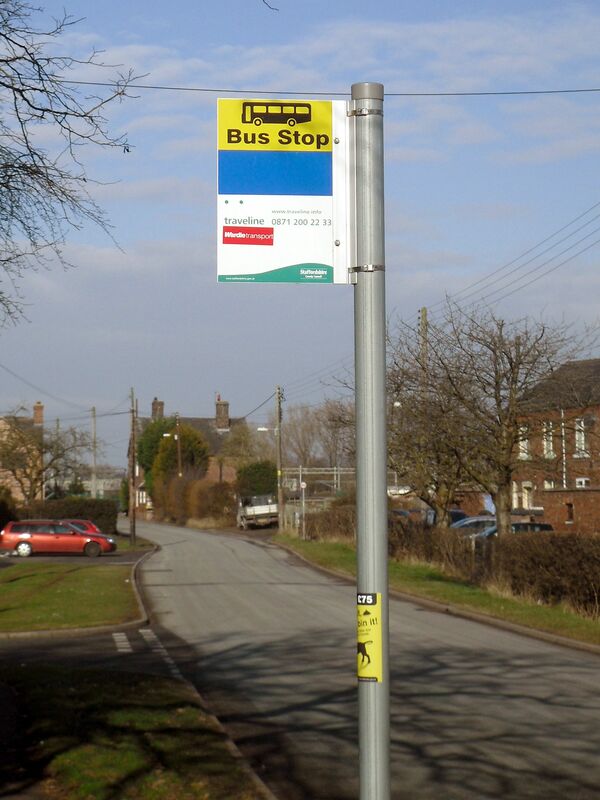 However, there are no trains to Norton Bridge, so the official rail replacement bus service (the number 490, operated by Wardle Transport) would have to do. We waited a few minutes before a small red single-decker came round the corner and pulled up. We climbed aboard and proferred our Great Escape tickets to the driver, who accepted them without really looking at them. We did not set off straight away, as the driver nipped out of his cab for a quick smoke before proceeding. 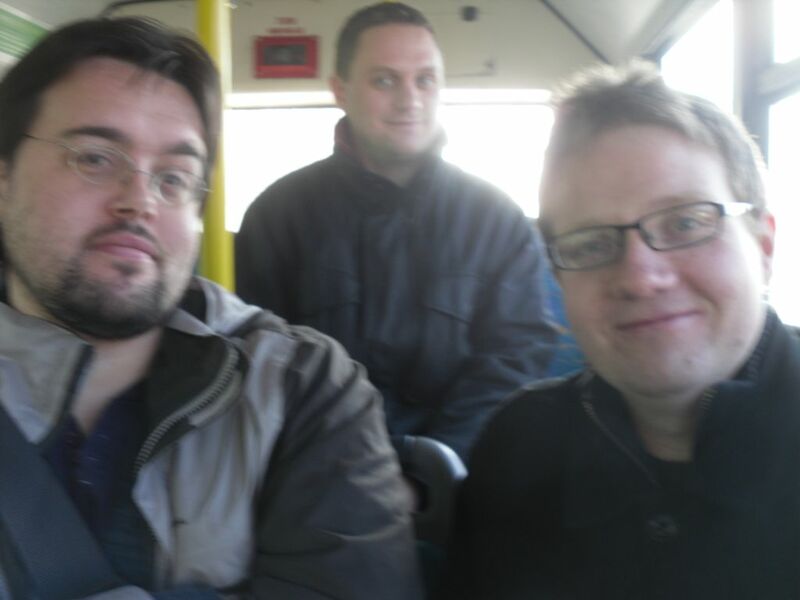 During this lull in proceedings, I got a picture of the three of us. What a merry band of travellers we make! Only two other people boarded the bus at the station, although we gained a few more people at the Sainsbury’s supermarket down the road. As seems normal for these services, all the passengers seemed to know each other, chatting amiably as we chugged along the streets. They were all decidedly elderly, so I hope they weren’t too offended by the conversation between the three of us, which soon became quite 18-rated (partly inspired by a recent tweet of mine). 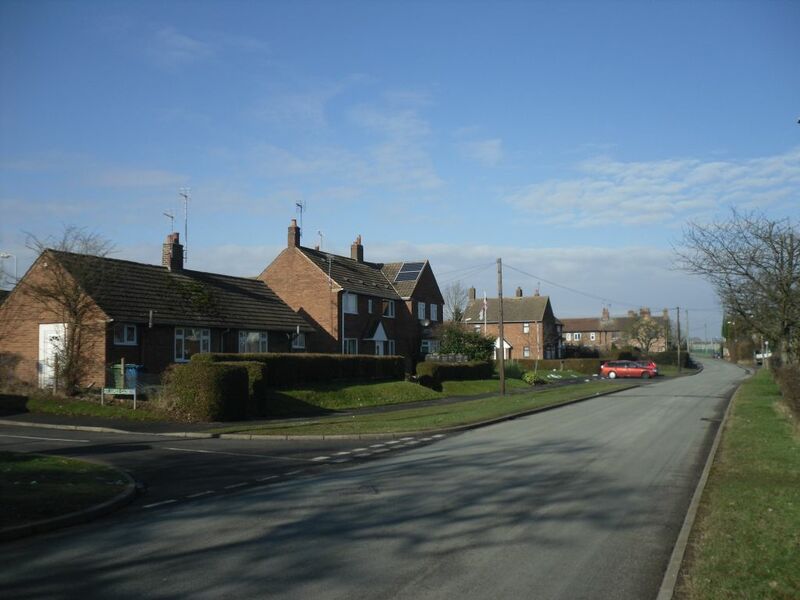 Once beyond Stafford, we left the main road and proceeded down a series of narrow, winding country lanes, (including a hair-raising crossing of a narrow bridge with 90-degree bends immediately before and after, which our bus could only just squeeze through). We passed The Mill Restaurant, which is apparently Staffordshire’s best kept secret (not that secret, if the large roadside signs advertising it are anything to go by) and then entered the village of Norton Bridge itself, where our bus pulled up outside the entrance to the station. Or rather, what had once been the entrance to the station. 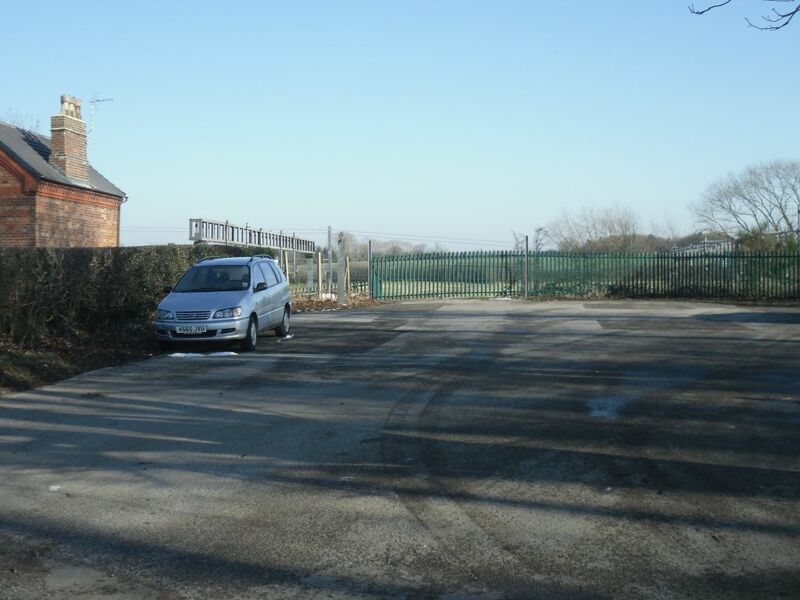 Where the station entrance stood, there is now only palisade fencing. There is no station sign with double-arrow logo – indeed, at street level there is no sign that a station exists here. Peer through the fence, however, and there is more to see. Norton Bridge station is (was?) 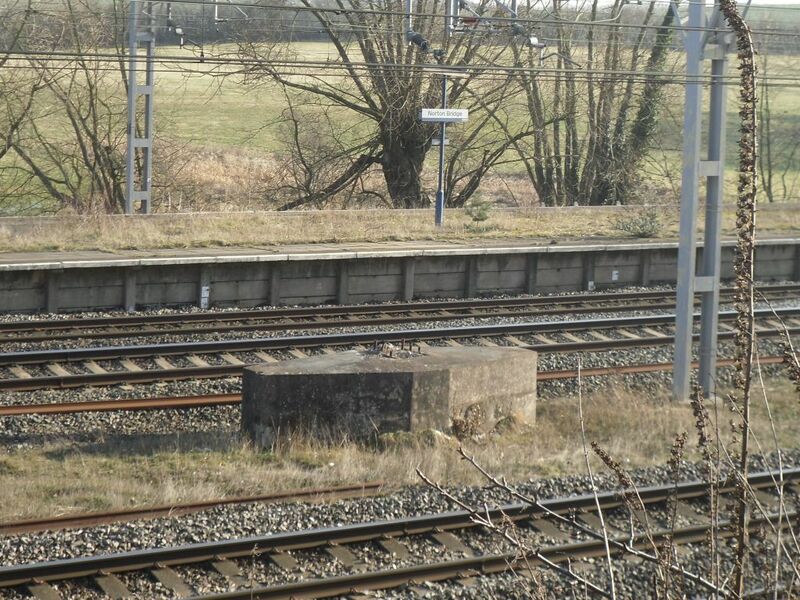 a single island platform, with the tracks of the West Coast Main Line passing either side of it. The station was never particularly busy, but until 2003 it was served by a local stopping service between Stafford and Stoke. 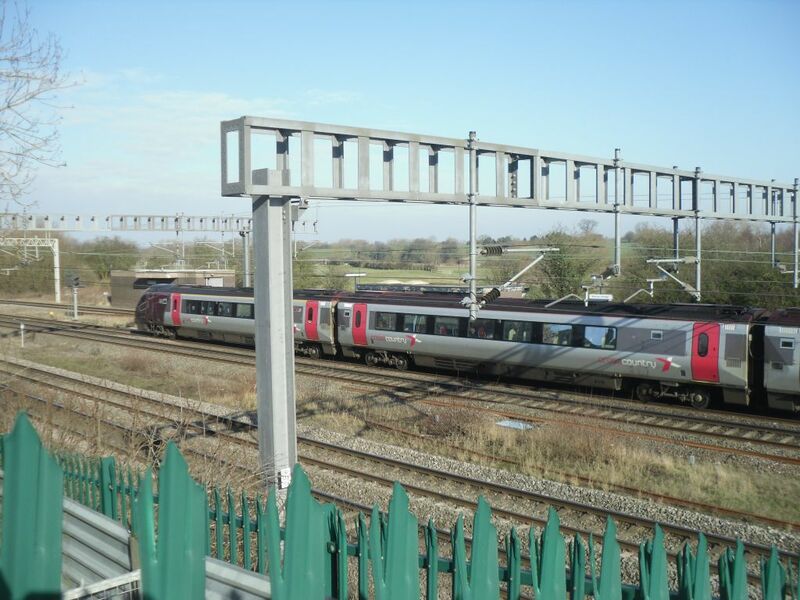 This service was withdrawn, supposedly as a “temporary” measure while work continued on the West Coast Main Line modernisation. 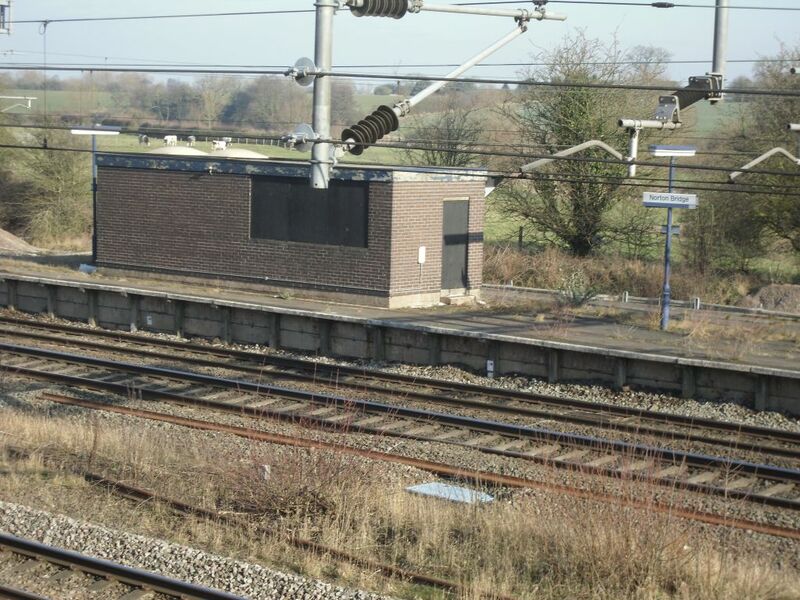 However, during the upgrade works, the footbridge giving access to the station’s platform was removed, leaving the platform marooned, with weeds growing on it and the former waiting room boarded up and derelict. Despite all this, the station is still officially open in the eyes of the railway. The existence of the 490 bus, which accepts rail tickets, is apparently considered sufficient to fulfil the train operator’s obligations. I was able to point my camera through the fence and grab plenty of shots of the isolated platform, complete with Regional Railways-branded signage. There is a “Way Out” signpost on the platform with an arrow pointing to the non-existant footbridge. The only remnant of the bridge is the concrete base in the gap between tracks. There was a small gap where the fence was lower. With some careful positioning, Ian was able to get a shot of me with one of the station nameboards in the background, which I had to accept as the Station Master picture. We had an hour to kill before our bus back to Stafford, so we took time to explore the village (well, hamlet, really) of Norton Bridge. The brief Wikipedia article about the village states, in typical understated fashion, that it is “lacking amenities for residents”, and this is certainly true. We walked the length of Station Road (a name now tinged with irony), and saw very little of note. 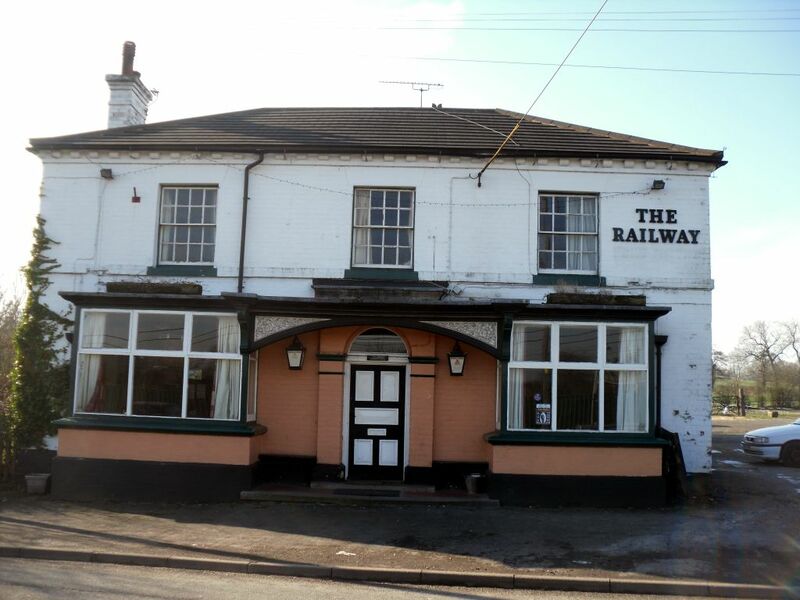 There is a church, a phone box and a pub, the Railway Inn, which was closed. And that was it. Not even a village shop. An England flag fluttered gently in the breeze in one of the well-kept front gardens, and that was just about the only visible sign of movement. Scott and Ian seemed unimpressed that I had dragged them to this isolated, lonely place. I ignored their complaints – the station was what I had come for, and seeing that was enough in itself as far as I was concerned. In search of civilisation, we wandered as far as Smithy Lane at the edge of the village, but found nothing but a field full of sheep and an older gentleman with a walking stick wandering around in a suspicious fashion. In a final desperate attempt to find something of interest, we checked Grindr to see where the nearest fellow homosexual was (2.9km away, if you’re interested). Having exhausted the limited entertainment options available, there was nothing else to do but to trudge back to the bus stop. 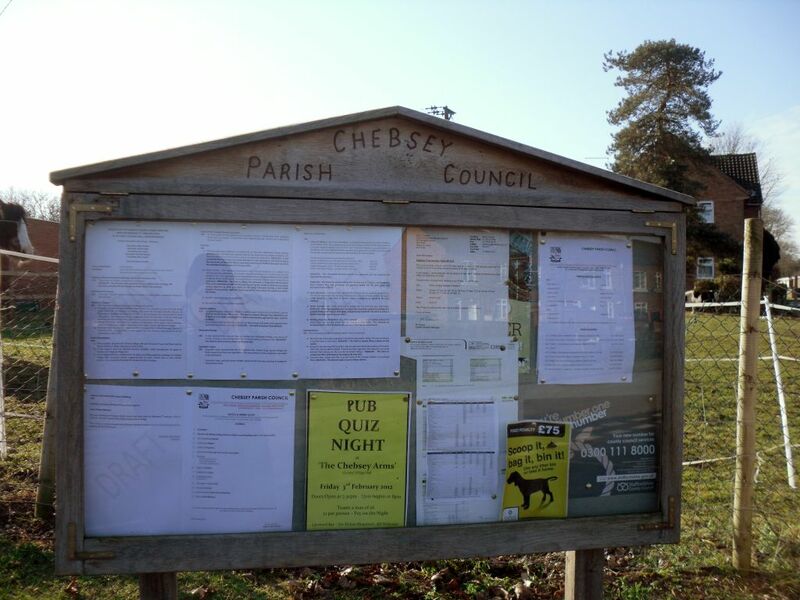 The Parish council noticeboard was busy with details of meetings and social events, although I couldn’t help but think that it was a picture of a noose on the poster in the bottom right. As we waited for our bus back, a train crawled through the station, eventually coming to a halt next to the platform, where it waited a minute or so to allow another train to overtake. I pondered: if the footbridge were still there, there would have been no time penalty to that train if the doors had been released to allow one or two people (which, realistically, is all there would ever be here) to board or alight. Unfortunately, the footbridge will never come back: the cost of a replacement could never be justified, given the low traffic potential. 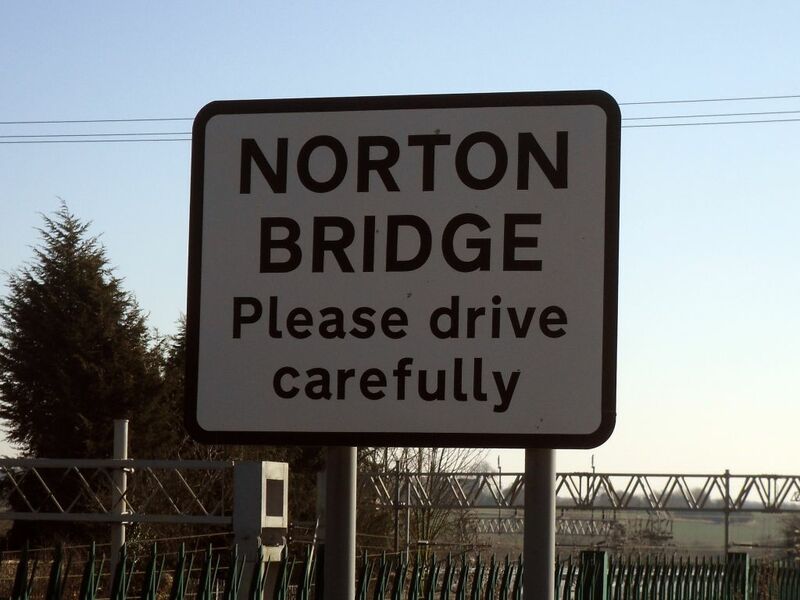 Norton Bridge is almost certainly doomed. 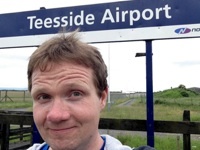 Just north of the station, there is a junction where the line to Stoke diverges from the West Coast Main Line. Network Rail is proposing to remodel this junction to improve line speeds and increase capacity. If this plan goes ahead, the platform is likely to be demolished entirely. It will be interesting to see if the formal closure procedure finally takes place. 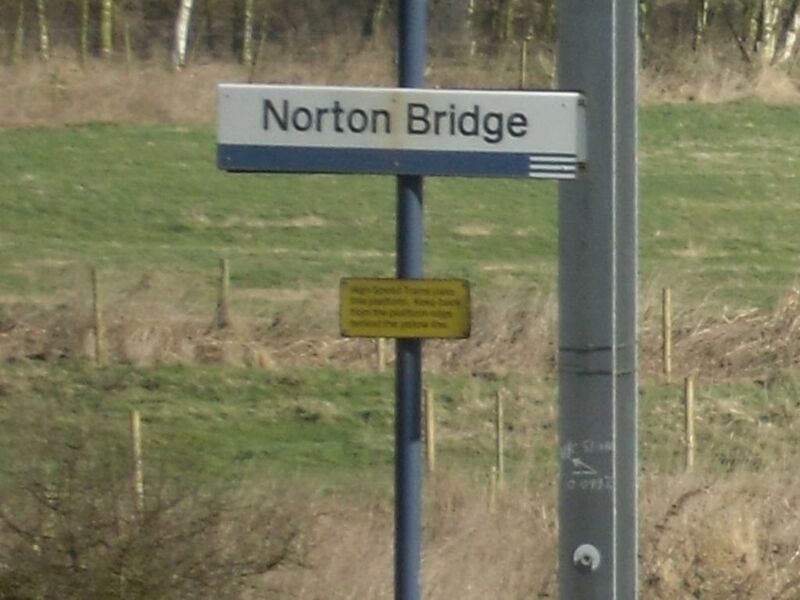 Until then, however, Norton Bridge will remain as one of the oddest stations on the National Rail network. It’s a station whose operation complies with the letter of the law but in practice helps nobody; a monument to the myriad rules and regulations of the railway which are supposed to protect the passenger’s interests, but which in practice can be twisted to suit the needs of officialdom. This is great – not seen any blog posts for the ghost stations in North Staffs before. Looking forward to your wrirte-ups for the other nearby ghosties. It is a fetching scarf, by the way. You sure you weren’t commentating on the Six Nations? A Barlaston pun? Not sure, but I was born there, a birthplace I share with 90s footballer and outdoor ursuits enthusiast Stan Collymore. Thanks for this. I whooshed through the station (halt, really) just now on a Pendolino to Chester and wondered about its history. Great to have some background and opinion about it. Cheers.